Any one who has visited my blog knows I have a love for one challenge blog above all others. Runway Inspired Challenge has the BEST design team in the business. Ok, maybe I am a little biased, but they showcase cards that make my jaw drop every time. The concept is based on a runway photo which is used to inspire a card. Clever eh? Last week I won the challenge and the prize was a guest spot with the Design team. PINCH ME because I can't believe it. My dream has come true. Here is what happened after I won. 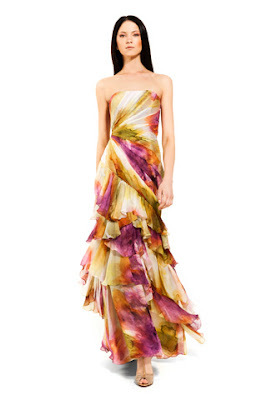 For a solid 30 hours I stared at the dress that Jennifer Rzasa emailed me. Why? because I was choking under the pressure of making a card that would be in the company of these women. and THEN a trip to Archiver's for some purple distress ink. right after these messages, JUST KIDDING! Sorry, this card was removed for publication! Love it so much, Wida! It's a masterpiece! You so rock this challenge, Wida!Congrats on the RIC guest design! Stunning card! Congratulations on your guest designer spot, and I adore this card!! Just added the video to my favourites. Just stunning Wida, and utterly you! Congratulations on your guest spot, so deserved. wow, what a stunning card, Wida. I had watched that video before and tried that technique several times, but never succeeded so far. I must say, your flower came out very beautiful, and I like those rays of color! so perfectly done! This is gorgeous Wida! Love that background and the fussy cutting! Wida, you fit into the RIC team perfectly! No need to choke, you're a natural for this challenge. :-) Your card is beyond gorgeous, so stunningly beautiful! Well done, and congratulations on your guest DT spot. congratulations on your guest spot...your card is SO PRETTY...you totally rocked it.. So beautiful and perfect card! Congrats! and so well deserved! Absolutely, positively, stunningly gorgeous!! And so much better because you made it! Seriously, I adore this! I love your card in every way! The watercolor flower technique is really cool...I had never seen that before. I am sooo sooooo happy to have you as a guest this month! What a fabulous take on the inspiration point! Your card inspired me to dig out my watercolours and play! Your card fits in perfectly with the rest of the amazing DTs creations! Absolutely GORGEOUS card! Love this! Ack, this is gorgeous!!!!! The colors are phenomonal! Can't wait to see what you create for the next challenge! Oh my word! This may be the most beautiful card ever! You truly rise to the occasion given a challenge, don't you? I'm absolutely thrilled for you to be the guest on this design team! Congratulations. Have a ball. Wida, this is beautiful!! Congrats on the guest DT! Wow! This is such a gorgeous card...perfect fit for this Runway Inspired Challenge. And congrats on the guest DT -- you rock! Breathtaking Wida! I can hear how delighted you are to be guesting - congratulations! Well, this is totally stunning, Wida!!! I read your post, word for word and then embraced myself to prepare to see something awesome..... and so I did!! Your card did not disappoint!! Superb!! And of course, congrats on the DT gig. They picked the right girl for the job! congrats and way to rock the challenge! You were meant to be our guestie! This is gorgeous. I love all the layers and different tones on that flower! Big hugs! This is spectacular!!! You were most definitely up to the challenge!!! Seriously this is gorgeous! Love the design and you executed that watercolor technique perfectly!!!! Fantastic interpretation of the inspiration pic! This is BEAUTIFUL ! I'd love to know how you did the "rays" too. STUNNING colors!!! WOW, really beautiful card! Wida this is STUNNING & GORGEOUS!!!! Huge Congrats on your Guest DT Spot!!! You totally deserve it, your cards are AMAZING!!! Wow, this is the most beautiful card. Just incredible. You definitely deserve the guest spot. Another beauty!! One of your best in my opinion!! You've really rocked this challenge - I just adore the rays of colour, so like the bodice, behind the rose!